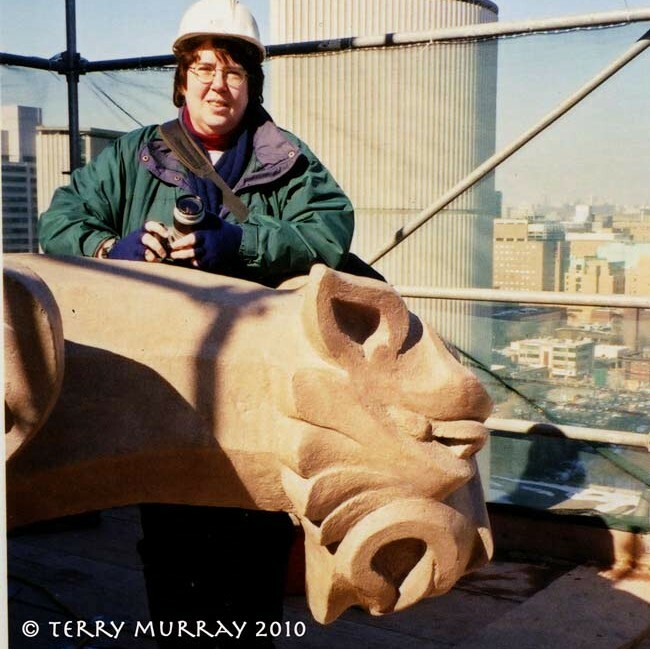 Last Monday, the sculpture of the woman (let’s call her Our Lady of York) was taken down from the 60 Richmond Street East building. I was able to document how half of the job was done. 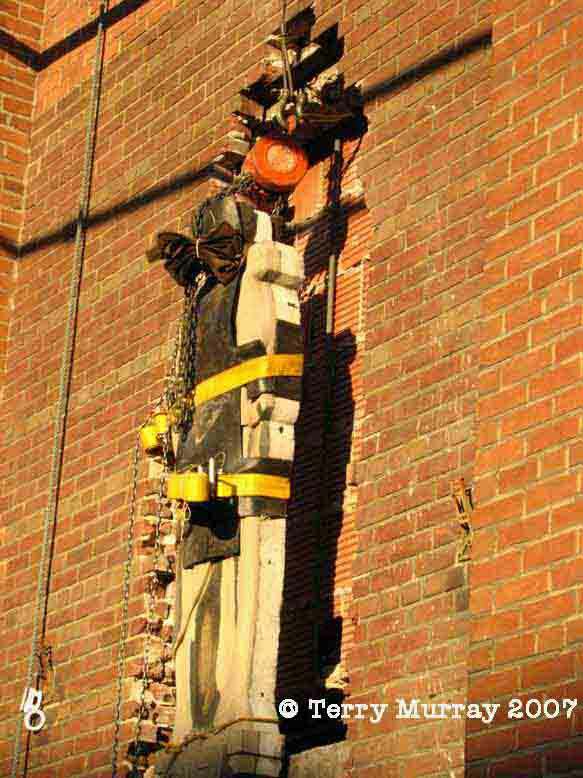 When I arrived at the site, wearing my new steel-toed boots and hard hat, the Lady had been freed from her surrounding brick and was bundled up to protect her from potentially damaging bumps on the way down. The guys from Bird Construction began sloooowly lowering her … and then found the board they’d propped up to ease her down wouldn’t work. So they scrambled to find a new board … which worked just fine. But as she got nearer the ground, it became apparent that the chain holding her from the top wasn’t long enough. So the guys took a break, sent for a longer chain… and I had to go to my real job. The Lady hung there until she was taken down either later that day or on Tuesday. I wasn’t able to get back to the site to see the complete removal, so I don’t know what the next steps would have been: how they’d get all 1,000 pounds of her from an upright position to the horizontal (presumably) to move her to a storage facility. Where she will end up is a bit uncertain. I talked to Leslie Gash at Toronto Housing, and she’d like to see Our Lady put on the the new building. But the building’s design doesn’t look like the right style for Our Lady. See renderings of the new building included in this Globe and Mail story by John Bentley Mays. Leslie said she supposed Our Lady could go inside the building, but she thought the sculpture really ought to be out where it can be seen. That’s my feeling exactly. It drives me nuts when these pieces, executed by some of our leading sculptors, are removed when a building is remodeled – and then put inside, where no one but indifferent employees can see them. The Rogers building at 333 Bloor Street East (a part of the complex where I work) is probably the worst offender, for reasons I outline in Faces on Places. And that involved a Jacobine Jones sculpture too. Glad to see someone else appreciates these public works of art.